This adaptation, appropriate for middle school and high school students alike, contains much of Shakespeare's original poetry and language but with an additional female role, that of Nerissa, a gentlewoman of the court. The play, a satiric comedy about "romantic" love, features two contrasting couples. There is Benedick, a cad, who has sworn to forever remain a bachelor. But as it turns out, he meets his match when he encounters Beatrice, a strong, intelligent, witty woman. Beatrice doesn't need a man, and she doesn't want one either. Then there is Claudio, the sappy, headstrong lover who is convinced his true love, Hero, is the purest of earthly angels. Hero is quite satisfied to have found her match however, her trusting and naïve nature makes her vulnerable to catastrophe. It's a timeless battle of the sexes. Performance time about 75 minutes. 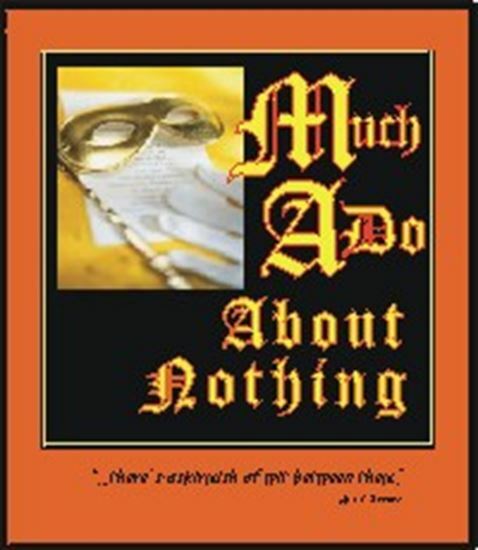 TALKS ABOUT "MUCH ADO ABOUT NOTHING"
A: I took my young son and daughter to see the film, and though I'm sure some of it was over their heads, they also thought it was wonderful. I decided an adaptation would be great fun to do at the middle school where I teach. Q: WHAT'S YOUR FAVORITE PART OR LINE IN YOUR ADAPTATION? WHY? A: My favorite part is when Benedick is sitting, writing sappy poetry, claiming he can't rhyme. He haltingly reads lines from contemporary silly love songs and after each line he says "rubbish" or "poppycock." That always gets roars from the audience. I like this part because it is my humble addition to Shakespeare's genius, and I love to hear the audience laugh. My favorite line is Shakespeare's, "Man is just a giddy thing, and this is my conclusion." A: I started writing poetry during my years in college. I continued writing poetry occasionally throughout the years but didn't really venture into other genres of writing until I found myself writing curriculum and activities for my students. I think I fine-tuned my skills in letters to parents! Q: HOW DID YOU GET STARTED AS A PLAYWRIGHT? A: I had been asked to add Shakespeare to the curriculum of our middle school. Since I had always enjoyed having my students do performances for parents, I decided to actually do one of Shakespeare's plays. When I looked for an adaptation appropriate for this age level, all I could find was material that had been "dumbed down" so much it had lost the original richness of Shakespeare's language and themes. I decided I would have to write my own adaptation to suit my students' intelligence and abilities. Q: WHAT DO YOU LIKE MOST ABOUT WRITING PLAYS? A: Plays and poetry are similar in construction. Every word needs to be the best choice. The nuances and metaphors contained in dialogue need to be rich and concise. There is a basic structure. Of course, much of Shakespeare is poetry. Long, discursive, descriptive language is not my forte. Q: WHAT IS THE MOST CHALLENGING PART OF THE WRITING PROCESS? A: The most challenging part for me is actually allocating the time I need to do the writing. In a busy day, it seems like writing often ends up on the back burner. I usually work late into the night. Q: WHAT ARE THE MOST IMPORTANT THINGS TO CONSIDER WHEN WRITING A PLAY? A It is most important to consider two things: Who will be your actors, and who will be your audience. Q: WHERE DO YOUR CHARACTERS COME FROM? ARE THEY BASED ON PEOPLE YOU KNOW? A: My characters, the few I invent, are all based on Shakespeare. They are named in other Shakespeare plays. That's the great thing about Shakespeare, his characters are so real, so uniquely human, that they transcend time and place. We all know people with personalities who remind us of characters from Shakespeare. Q: WHAT DO YOU TRY TO ACHIEVE WITH YOUR PLAYS? A: I want to thrust my actors and my audience into the enchanting world that is the fabric of Shakespeare's vision. I want everyone to laugh at the comic parts because we shouldn't always take ourselves so seriously. Like any artist, I want my players and my viewers to leave the theater with new perspectives and insight. Q: WHAT ARE YOUR HOBBIES? WHAT DO YOU DO IN YOUR SPARE TIME? A: Actually, one could say at this point in my career that writing is a hobby. It hasn't started paying all the bills yet! I enjoy time with my family, hiking in the mountains, traveling to exotic places, and taking long walks with my dog. I enjoy my lifelong habit of reading before I retire every evening.